Kilz' new Clean Start primer preps walls for fresh paint and is eco-friendly, too. •Protects indoor air quality by eliminating VOCs (the volatile organic compounds or toxic fumes that are released into the air while the paint dries). •Delivers the quality performance expected from Kilz primers. •Allows for fewer top coats of paint, thus reducing costs. •Provides sealing and stain-blocking power. •Cleans up easily with soap and water. •Provides a mildew-resistant finish and blocks tannin bleed. •Improves and strengthens top-coat paint appearance. 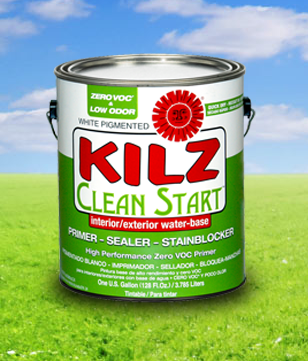 Perfect for DIY painters and professionals alike, Kilz Clean Start can be used on most interior and exterior surfaces, including woodwork, drywall, plaster, paneling, masonry, brick, painted metal and properly prepared glossy surfaces. More good news for the readers of my blog is a giveaway from the good people at Kilz of a $100 gift card that can be used at any of The Home Depot stores as well as a free can of Kilz Clean Start. If you’re interested in this offer, please contact me through the SHARE function located in the left-hand column of this site. The giveaway will go to the first reader who contacts me. To find out more about Kilz primers, visit its Web site. I’m getting ready to prep our yellow kitchen walls…this sounds great!